Posted on May 1, 2012, 10:02 am, by Thomas Hawk, under Flickr, Pinterest. Pinterest has been one of the most popular social sharing sites of the past year. It’s growth has been explosive. Last week Pinterest said that Monday and Tuesday were their highest traffic days ever. Last month Experian said that Pinterest was now the third most popular social network behind Facebook and Twitter. Photographer reaction to Pinterest has been mixed. Some photographers have been pleased with yet another avenue for their work to be seen, promoted and enjoyed by the world. Other photographers have expressed reservations about their work being pinned to the site without their permission, which they feel is a violation of their copyright. One of the big concerns about Pinterest has been that oftentimes photos are pinned without any sort of attribution to the original photographer. With so many beautiful images floating all over the web it seems easy for users to simply grab an image anywhere and pin it. In what seems like a win-win-win for Pinterest, Flickr, and photographers, Flickr and Pinterest are announcing today that they are more deeply integrating their two sites. Most significantly, photographers will receive attribution on any of their Flickr photos that appear on Pinterest both in the future and for any of their Flickr photos posted in the past. This attribution will visibly include their name as well as a link back to their original Flickr photo. “We want to embrace photo sharing, make it easy and beautiful and at the same time want to ensure that photographers are credited and attributed correctly. We also will continue to work with Pinterest on future enhancements to make sure Flickr members get the best tools to maintain control while sharing their photos with the world,” said Flickr head of product Markus Spiering. So what does this new deeper integration between Flickr and Pinterest mean more specifically? First, starting today Flickr members can share directly from Flickr to Pinterest. Pinterest will be included in Flickr’s share infrastructure. Second, all Flickr photos pined to Pinterest (for both new photos and old photos already pinned from Flickr) will include attribution, including the Flickr photographer name, photo title, and a direct link back to their photo on Flickr. This attribution cannot be edited by the Pinterest user and will ride with the photo wherever it is repinned on Pinterest. Third, anywhere someone grabs your photo that is linked back to Flickr (even non-Flickr blogs, websites, etc.) your attribution will flow through into Pinterest as long as your Flickr photo is the linked original source of the image. Fourth, as always you can always opt out of Pinterest sharing entirely. Flickr has a setting that you can enable which will restrict your Flickr photos from being pinned to Pinterest or shared elsewhere on the web. Today’s announcement should go a long way towards improving the relationship between Flickr photographers concerned about unauthorized photo usage on Pinterest and Pinterest. While someone still could download/screenshot your photo and reupload it to the web without attribution, at least where images are pinned directly there is a serious attempt being made here to credit the photographer for the image. This is also smart from both Flickr and Pinterest’s viewpoint. Although Flickr/Pinterest declined to release the total number of Flickr photos that have been pinned to date, the number is very large and now this means that Flickr just earned a boatload of new links directly back to Flickr. This should be good for Flickr’s page view count and drive traffic back to the site. For Pinterest, they are getting valuable real estate as a direct sharing partner for Flickr photos which should also drive more existing Flickr users to their site. Flickr more deeply integrating with one of the hottest social sharing sites on the web right now is yet another positive step forward for Flickr and is more evidence that Flickr is serious about ramping up innovation on the site as promised earlier this year. For Pinterest, this can be seen as a positive step forward in showing that they are more serious about addressing copyright/attribution concerns which have plagued the site over the course of the past year. You can follow me on Pinterest here and on Flickr here. Posted on February 13, 2012, 12:11 pm, by Thomas Hawk, under Pinterest. “I look at my photography like this. When I make an image it belongs to me. It belongs to me while I take the photo. It belongs to me while it sits in my camera. It belongs to me while I process it on my Mac. It belongs to me while I let it sit in an archive folder waiting to be uploaded to the internet. Then I upload it to the internet and it’s like I’m taking a bird and opening my window and letting it go. Off she goes. Her song to be enjoyed by the entire world — certainly no longer mine.” — Something I wrote about my photography a while back. 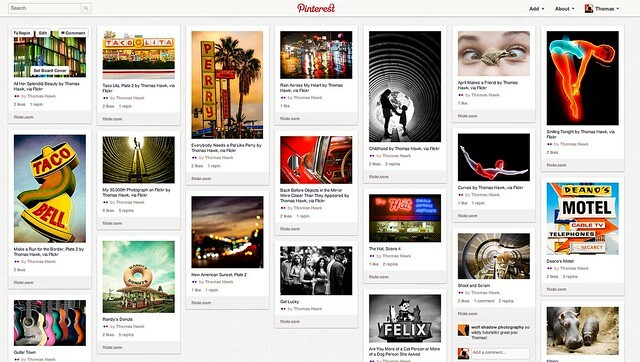 My good Pal Trey Ratcliff has a post out this morning about the hottest new site on the interwebs, Pinterest. “A pure artist has two motivations: creation for the sake of creation and sharing for the sake of connecting with the world. I’ve been on Pinterest for almost a year now (thanks Lotus Carroll!). The way I probably describe Pinterest to people most often is, “it’s what Flickr’s Galleries should have been.” Pinterest is one of the best curation tools on the web today. Using it is super easy. You just put a bookmarklet into your browser and click on it on any image on the web that you can share. That image is then presented on one of your boards as sort of an oversized thumbnail that links back to the original page that you are sharing from. TechCrunch says it’s 97% women. Well hello there ladies and Trey Ratcliff. Alot of old-school photographers are upset about sites like Pinterest and another popular sharing site Tumblr. I see photographers complaining about their images showing up on these non-commercial sharing sites and getting all wound up in knots. Some photographers spend all their time scouring the web using tools like Tineye and Google’s Reverse Image Search to find every possible unauthorized use of their images and then run around the web grumbling about this. As for me, I’ve always loved the curators, collectors and fans out there. I love it when people find one of my images and like it enough to want to share it on Pinterest or Tumblr or Google+ or wherever. I think that’s just awesome — as an artist it is my goal to have my work touch as many people as humanly possible. I want more and more and more and more people to see my work. I want people to think about it and react to it and appreciate it and share it. Long ago I recognized that part of putting work on the web comes with authorized use and unauthorized use both — especially lots and lots of unauthorized NON-COMMERCIAL use. Sometimes people don’t even credit me per my Creative Commons license. Would I rather people credit me as the creator of the image? Sure. But you know what, if they don’t I’m not going to lose any sleep over it. Because I got over that sort of negative way of viewing the world a long time ago. It’s better for your soul to just let it go. If someone uses your image in a blatant commercial way against your license, there are resources for you to pursue. But especially when people are using your images in non-commercial ways, life is just too short to worry about the little things like that. I, for one, welcome our new world that includes great new sites like Pinterest. I love that a vibrant new platform is emerging on the scene that celebrates beauty all around us. I’m honored that some in that community find beauty in my work and want to share that to others and so I’m a huge Pinterest fan. You can find me there here.